This is love. Her name is 9-5. She comes from the Land of Snow and Ice. She will wrinkle your tie and tousle your hair. Your friends won’t understand. Turn Away. She is stark and glorious and chilled. Her body is high-speed tooled from a solid billet of pure adrenaline. She will scar your soul if you don’t back down. But it’s too late, even if you close your eyes. Sweet turbo aphrodisiac all over your smitten lips. Satellite reception is crystal clear in an eight-way power passenger seat. XWD and ESP. USB for your MP3. Who’s at the wheel? Lightly tracing chrome with her pinky finger? That’s love. And she’s looking at you. 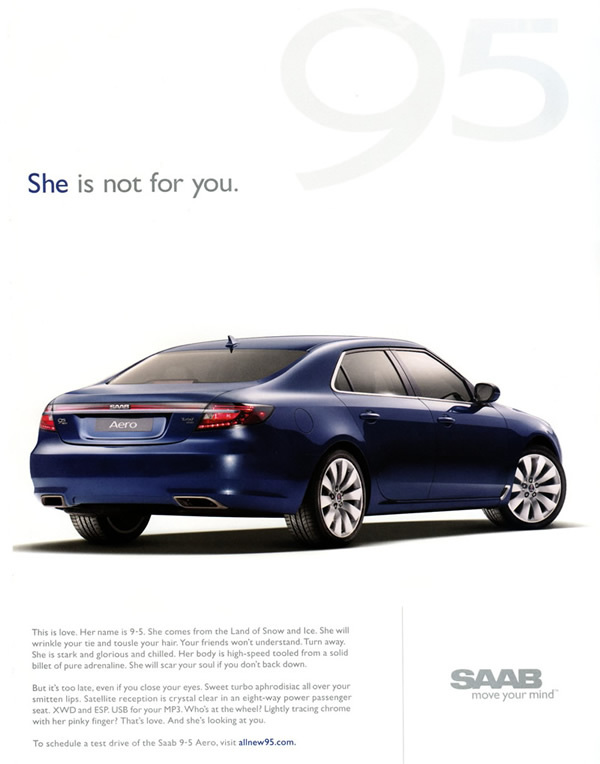 I still don’t get the tag line “She is not for you”. What am I missing?